Return to Website > Index > General > Bible Prophecy Forum Postings > Re: Taylor (14 Apr 2011) "Rapture Date"
Re: Taylor (14 Apr 2011) "Rapture Date"
Mike, every time I think of 62 + 7, I would reject deep in my hearth to add this up like what others did!! YHWH's Word is not a source of confusion, so your theory of Yahshua was cut off right after 62 weeks caught my eyes! That left only 7 weeks to fulfill in which the counting began on the order of restore Yerushalayim in 1969. Now I began to goose bump, please continue Mike what is the rest ... I am interested to know the rest explanation of 7 weeks instead of 1 week? Love to know people like you who rightly divide God's Word! Pls note this period includes the 49years (7weeks of years) from the same decree of Cyrus till Artexerxes's decree to build the walls of Jerusalem within 52days. see Nehemiah 6:15. Note 52days is the same period from Jesus' death (cut-off) 3rd day + 49days till Pentecost. in the midst of the week Jesus was crucified. after possible few years…HolySpirit filled (Stephen) was rejected. +4or3 years when Stephen(HolySpirit) was rejected and stoned to death. see Acts Chapter 7:51-60 "Ye…always resist the Holy Ghost: as your fathers did…And they stoned Stephen, calling upon God and saying, Lord Jesus, receive my spirit…and cried with a loud voice, Lord, lay not this sin to their charge…"
Thus ended the week of 7years. Israel miraculously won the war in 6Days and rested in the 7th Day. It would be fulfilled that Israel will build the wall in 2016 or 2018. From the time Scribes and Pharisees which were of Jerusalem came to Jesus, possibly 40 days before the feeding of the 4000 which could be another passover, 1 year before His entry into Jerusalem in 10th of 1st month. in the midst of the week Jesus was crucified on 13th night buried before 14th (Passover). 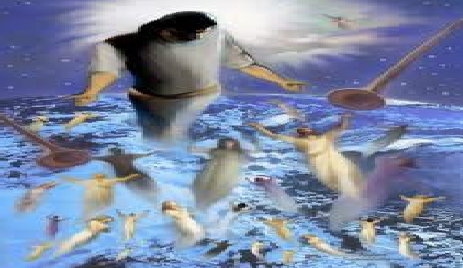 Rapture by Jesus and Covenant of death within 2011AD? = 1 year before Pentecost of 2011AD? Thanks a lot Mike, then I guess we have an absolute Deadline, that is year 2018. This what I liked, treating the Bible as a scientific resource, therefore never it will be wrong at anytime, though our interpretation could be wrong. However, I feel, it was very clear 1948 was a turning point, 1969 was another turning point, all began the counting, time limit has been applied. In short, if we pass 2018, then the word is not fulfilled, but that's impossible because, it must be fulfilled, therefore it must happen before the final deadline 2018. QED. You know these weeks, I have goose bumps that something significant will happen preceeding the rapture of the church and it's gonna be huge .... It's really hard to concentrate on other things when you know for almost sure that the deadline is 2011. I just want to thank you again so much for joining this website,your thoughts, comments, and fellowship! Your website is where we can agree or disagree and discuss so many 'open' ideas, thoughts, comments and informations.